Lived most of my adult life in the San Francisco Bay Area, California. Left a piece of my heart there. The public’s unexpected rallying to Clinton’s side led to a transformation of the Washington establishment’s judgment of his political viability. Before news of Clinton’s polling boost, political insiders had all but written him off. Public support for the president allowed, if not encouraged, congressional Democrats to rally to his side. The impact of Clinton’s standing in the polls along with growing antipathy toward the president’s accusers were also potent factors in the impeachment debate and the broader politics of that contentious midterm year. The public stood by Clinton through each chapter of the saga: his grand jury testimony, his admission of lying, the revelations of the Starr report, and ultimately the Republican vote to impeach him. He ended the year with a 71% approval rating. His party actually picked up eight seats in the House of Representatives — an unusual occurrence for a second-term president, let alone one about to be impeached. It is inconceivable to think that public opinion could have had such an impact in an era prior to the emergence of the media polls. 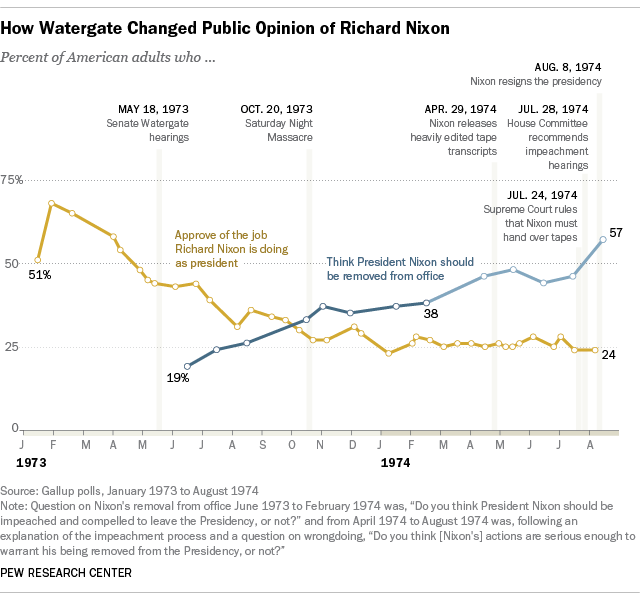 One lesson from Watergate is that public opinion is crucial. When it does events move quickly, as they do when tipping points are reached. During 1973 and 1974 Nixon's approval rating eroded and stayed low. Public desire for removal from office rose over that time. Aug 7: Two R Senators meet Nixon at WH. Senators can sniff the wind. Over the course of its sprawling 22-month investigation into Russian interference in the 2016 election, the special counsel's team referred 14 criminal cases to other offices, Mueller's 448-page report revealed. Only two of those referrals -- one involving former Trump lawyer Michael Cohen, the other former Obama White House counsel Gregory Craig -- are public at this point. "During the course of the investigation, the Office periodically identified evidence of potential criminal activity that was outside the scope of the Special Counsel's jurisdiction," the report says. "After consultation with the Office of the Deputy Attorney General, the Office referred that evidence to appropriate law enforcement authorities, principally other components of the Department of Justice and the FBI." Information on the mystery referrals was redacted for potential "harm to (an) ongoing matter," the report said. Note well: Each referral can lead to multiple indictments and convictions of multiple people. Lots. It requires a deep realization that rage doesn't work. And I mean deep. I sometimes act angry to overcome some obstruction that might crop up in an ordinary life, like a lazy official or somebody who needs to correct an error now rather than next year. But even though it is for effect, it is never acting hot anger. The feeling I project is great determination and focus. Sometimes something happens and I get angry or even very angry, but as soon as I realize that is happening, I let it go. I take a deep breath or two and come back to basic concepts of equilibrium. Mind you I've been doing so for years. Meditation is a big help, though I rarely do formal meditation. Instead I cultivate a constant meditative frame of mind. But I don't carry rage. I don't feed rage. North American First Nations would say "Feed the good wolf." For me, zen philosophy was the purest distillation of what needs to be done. Life is short. Why fill the Now with rage and anger and fuming? Especially since it doesn't work. Understand that and you will be released. Keep coming back to that. Another excellent distillation is this: "Give me the power to change what I can, the peace to accept the rest, and the wisdom to tell the difference between the two." I say always be beginning, even when you have great skill. A long time ago I heard a zen monk say to imagine opening a door or window in your mind and letting a breeze blow the emotion out. That has been helpful over the years. Letting out the deep breath is a breeze and it can carry out the emotions. However, simply letting go is not enough. The irritant is still there so something needs to replace the rage, otherwise it will soon be back. That's why I say replace it with "cold calculating loathing" re tRump and the Republicon-Trump Party. This is feeding the good wolf. Loathing, because the irritant is still a problem that must not be neglected, in this case a big problem. Loathing is not being enraged, no seeing red, no blood pressure issues. Cold, so that there is no rage. Calculating to devise and execute actions. "Nothing works for long"? If it works even for a short time, keep doing it (except self-medicating!). Practice is key. Never get angry at yourself for failing. Get up, carry on. Musashi was a duellist (non-firearms) in old Japan and never lost, even though his opponents were fearsome and formidable. Musashi on using anger, great story. I got carried away on the quotes below, but use what helps and read the Book of Five Rings if you at all can. I apply this one to impeachment of tRump: If you can't cut him down with conviction in the Senate, impeachment that fails will only make him stronger. Note: This requires preparation (analysis) and planning. ... one that the anti-socialist anti-communist anti-poor pro-tax-cut Trump-Republicon Party will hate. ... one that truly perceptive capitalists will embrace. ... one that is tried and tested and has (in smaller form) had big benefits for the US already. I think what is needed is for society to guarantee a basic floor with the big three: Housing, health care, and a basic income for expenses. EVERYWHERE THIS HAS BEEN TRIED IT HAS HAD POSITIVE EFFECTS: reduced policing needs, lower health costs, higher employment, fewer social problems. It saves money! Hypocritical moralists and greedy people are blind to the fact (proven many times) that, when given the big three, people don't goof off and quit jobs and laze around. Quite the opposite. With a stable situation including less interruption due to health crises, people seek and find more jobs and work harder. If the big three are taken care of for ALL residents in a nation, then capitalists would be much freer to introduce production and service systems that we can expect to lead to job losses and job transformations. The nation can afford it. It truly can and the synergistic effects are wonderful. Look at the huge boom in the 1950s and 60s when massive GI housing, health care, and education expenditures were operative. Pay attention capitalists! The alternatives all include social unrest in varying and greater degrees. All part of the income & wealth inequality that is the biggest undiscussed problem the USA faces. When the 0.01 % squeeze the 47 % with the help of their corrupt RepubliCon-Trump Party politicians and unqualified ultra-conservative judges, this is the result. It will get worse before it gets fixed. I'm hoping it gets fixed peacefully and democratically. It will undoubtedly take Democrats to do it. So good to see. Absolutely possible to support all four women. Pelosi is very gracious. Some here and elsewhere tried to sharpen differences between Pelosi and the wings (caucuses) those women represent. It seems to me that every move Pelosi has made has run counter to that narrative; Pelosi has united the Party and among the elected members it is running very efficiently. He's had two years leading his party in complete control of the Congress, yet he has been unable to fulfill his central campaign promise: Trump's Folly: his wall. Central Trump promise: a wall. He can't even get a simple wall built while having complete control of Congress. Trump is a failure. His base will begin to abandon him now. His demise draws nearer and will be swift in action. Now is the time for all the discussion about who is best for the Ds & policies, etc. When we ask for unity in advance of elections, it is after the primaries and during the time when candidates with Ds beside their names are in front of the voters. The flip side is that outside of those times we MUST discuss leadership and policies. Have it all out now so that later we can be united again when it counts. Discussion of leadership and policies can be divisive but it MUST occur. Now is the time. Shouting for them to die is as wise as commanding the sea to calm itself. It would be as successful as demanding that we go back to hand assembled vacuum tube radios. It's not going to happen. It's not the problem. It's a solution and a good thing. The problem is the inequality of distribution of wealth and income. Too much is concentrated in too few hands for the good of society. A civilization as powerful and capable as on that has robots and Lean manufacturing techniques is one that can afford health care for all and a roof over every head with clean water and comfort in old age.